A vocal harmonizer is what you need if you are a performer and wish to transform or tweak your voice. Today, these instruments have found wide usage in modern music and are extensively used in recording studios, live performances, and even for practice sessions in home studios. The right vocal harmonizer provides you with the necessary effect that will make you sound like a music professional. From robotic sounds to refined reverb, from alien sounds to compression, a harmonizer is more than just a vocal processor. Such instruments allow you the freedom of generating a voluminous vocal harmony by artificially generating the sound of backup vocalists. Certain harmonizers can also be applied to drums, keyboard, and guitars. There are few things to keep in mind when opting for a vocal harmonizer pedal, and here we will review four best vocal harmonizers to ease your process of selection. 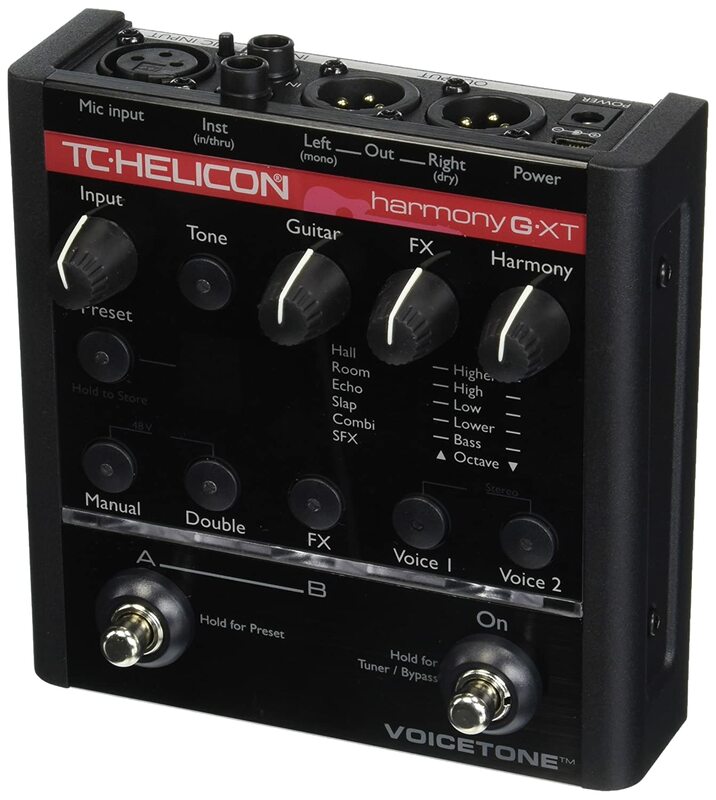 The TC Helicon VoiceTone Harmony-G XT is one of the best harmonizers available in the market today. Equipped with numerous utilitarian features, it will let you focus on your performance and help you add specific vocal effects while executing a musical piece. This vocal harmonizer creates natural stunning sounds by simply listening to your guitar or your voice. It boasts of revolutionary effects and you are presented with numerous harmony choices like reverb, pitch correction, echo, toggling, doubling effects, tone control and even A/B switching between effects. The Harmony-G XT lets you perform to your fullest capacity. The best feature about the TC Helicon VoiceTone Harmony-G XT is that it doesn’t demand any kind of pre-programming, special guitar pickups or widespread musical knowledge. You simply need to plug it in and select the option or the bass interval that fits your need. You may even use numerous harmonies without a guitar by just setting the key and scale. In addition to all this, the TC Helicon VoiceTone Harmony-G XT is designed with four overdub-style doubling effects that provide users with two additional doubling voices. You also get to try the tone control with pitch correction, µmod, and the preset selections. You can also easily switch between FX with the A/B switch or simply use the bypass and acquire the guitar tuner. More features include premium quality mic preamp and it can be used with Mic Control. This device is an extremely cost-effective way to improve and modify your voice. It rightfully complements your singing and provides endless possibilities for vocalists. Chiefly suited for solo performances, this vocal harmonizer pedal will add to your musicality and present an excellent sound for the audience. That is may be the best deal for your money! But I will leave for you to decide, because the other contenders good too, so there is a possibility that it would be a hard choice. A smart pick for singers and musicians who performs with guitars, the Boss VE-2 combines urbane sound with easy operations to deliver a complete solution for singers. This device is portable and battery-powered, that let you create refined studio-quality sounds at a diverse variety of performance venues. From street performances to concert stages and professional studios to practicing at home, this device delivers intelligent assistance. It helps you create harmonized vocals by automatically tracking the chords that are played on a preset key, connected guitar or a combination of both. Users can select from one of the three operation modes, to create balanced and real-time harmonies in any key. It comes with an exclusive Auto Harmony function that inevitably detects chords played on the connected guitar and thereby generates seamless, matching harmonies. It is designed with a dedicated panel knob that let solo singers manually set the song key and create soothing harmonies. It is also equipped with Hybrid Mode that effectively creates harmonies on manual key setting and guitar cord input. This is particularly suitable for music pieces where there are guitar part transitions between lead playing and rhythm. Additionally, there are twenty-four harmony types to select from. You can quickly select the key manually, or you can plug in your guitar to utilize the Auto Harmonist mode. 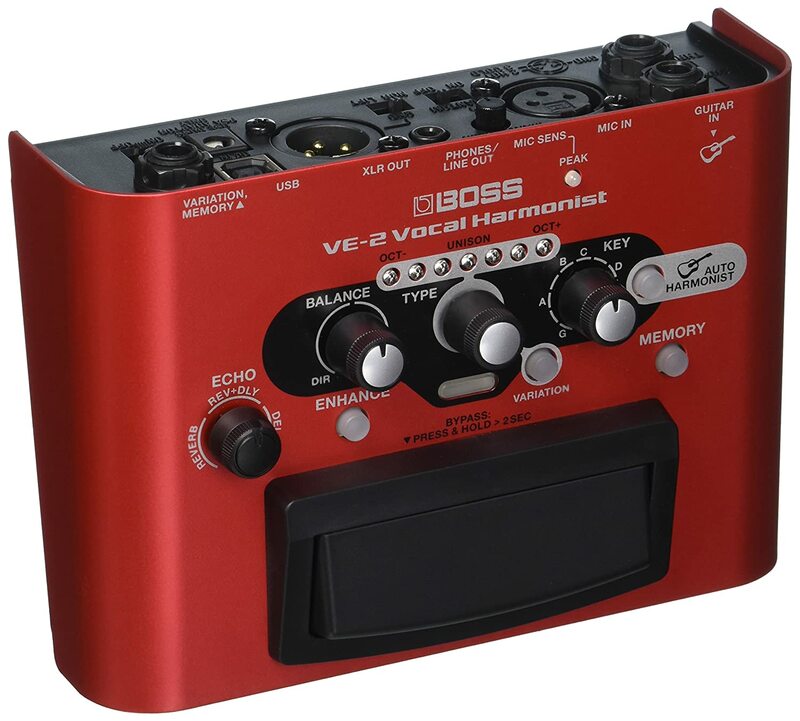 The Boss VE-2 comes with a user-friendly interface and is an easy solution for vocalists who are not acquainted with processing effects. It also has easy dial up reverb and delay effects options with a single knob operation. It is equipped with enhanced function control dynamics that ensure subtle pitch correction while you are singing. Additional features include three memories for storage of favorite settings, XLR mic input with phantom power and more. This Boss VE-2 vocal harmonizer pedal effectively runs on four AA-size batteries or PSA-series AC adapter. To experience and play sophisticated and high-quality sound, you may opt for the Digitech VLFX. This next generation vocal processor helps you create studio grade sound effects. This device is especially effective when performing on stage as it puts professional studio quality vocal effects at your disposal. It comes with over 65 vocal effects that provide singers with finest vocal enhancements. It is designed with options like dbx compression, Lexicon Reverb, Harmony, Modulation, Delay, Pitch/FX, Distortion/Filter and Reverb and Automatic Feedback Suppression that aid you in enhancing your performance. It is also equipped with 15 useful processors and 12-band feedback suppressers that make it a smart pick. For generating a polished and smoother vocal effect, the Digitech VLFX comes with gold channel processing and seven excellent on-board effects. The specialty of the Digitech VLFX is that it has easy to use features and has a headphone output that provides easy monitoring for personal practice. 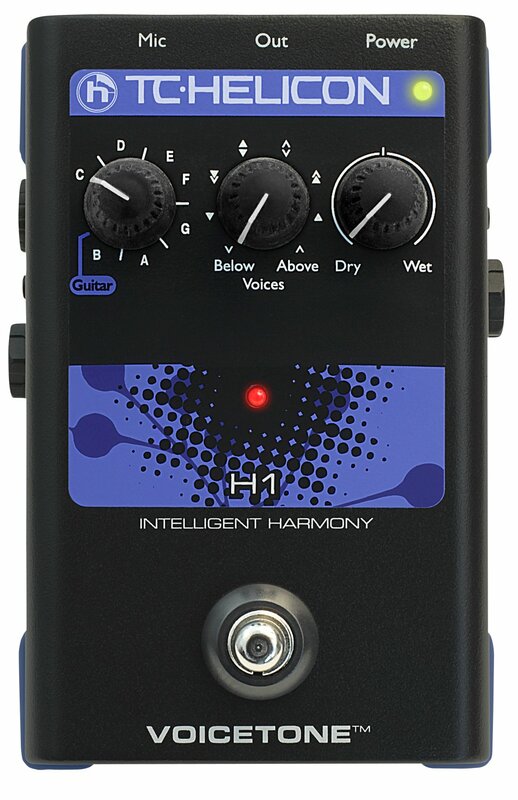 The TC Electronics Singles VoiceTone H1 Vocal Effects Processor is a great way to add harmonies to your vocals. You can simply cable the H1Vocal Effects Processor to all of the other VoiceTone Singles for enhanced effects and to define your personal sound. By using smart and precise calculations, this new-generation device effectively adds notes to your vocal melody. This model also works with Ditto MicLooper along with the pure looping pedal for instrumentalists and singers. It comes with on-off foot-switch and USB connection for updates. Also, you can also add harmonies below, above, close, far and in any combination that you prefer.The TC Electronics Singles VoiceTone H1 Vocal Effects Processor renovates your voice and enthralls your audience like never before.